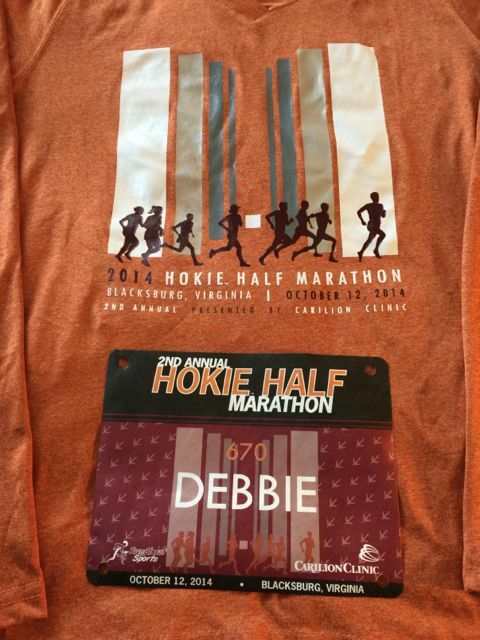 Upon arriving in Blacksburg Friday evening and checking into The Inn at Virginia Tech, the host location for the 2nd Annual Hokie Half Marathon & 5K Race Expo, Bill and I were greeted warmly by the staff who immediately asked us if we were there for the race. 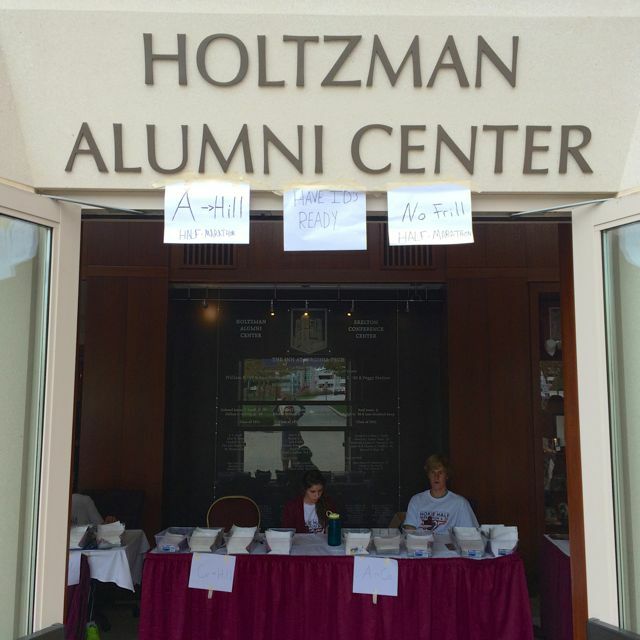 They reminded us that the expo would be the following day in the adjoining Holtzman Alumni Center. Easels in the lobby displayed the following two posters, and added to the excitement of the race weekend ahead. 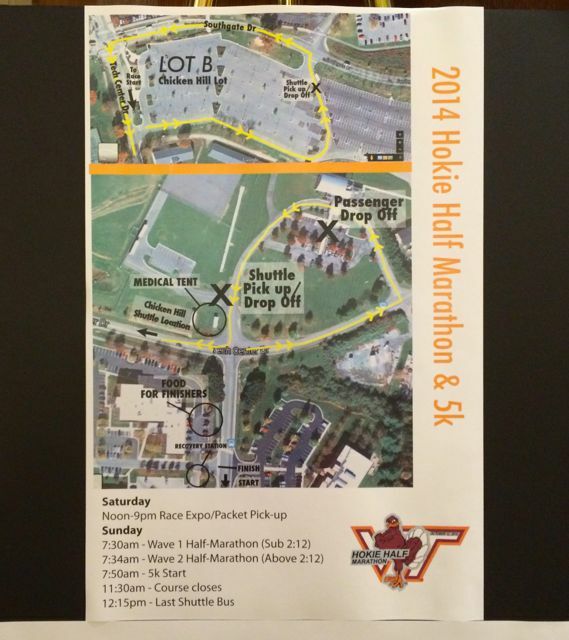 I studied the course map and tried to figure out how the course change would affect my performance. Construction near the New River Valley Mall meant that a flat section of last year’s course needed to be removed. 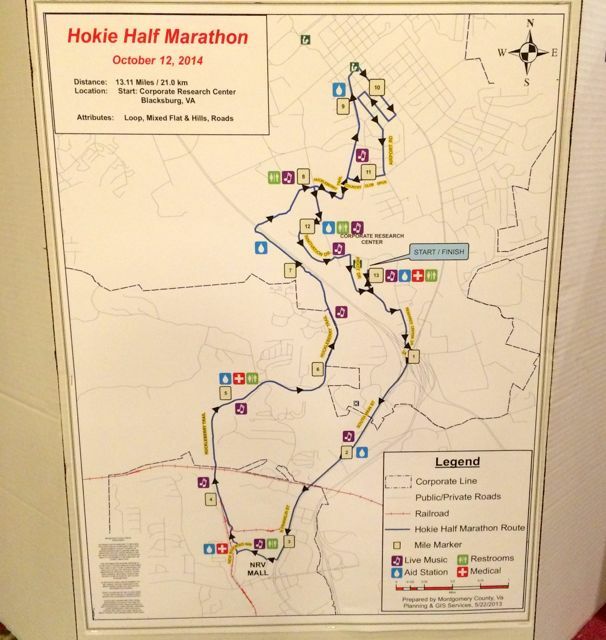 That extra mile or so was made up in Blacksburg in a hilly section of town. Even though I know Blacksburg so well, it wasn’t until I was on the course that I had a true sense of the impact of the course change. At noon on Saturday, Bill and I headed to the Holtzman Alumni Center by walking through The Inn, and had to dodge lots of cute little bug enthusiasts along the way. 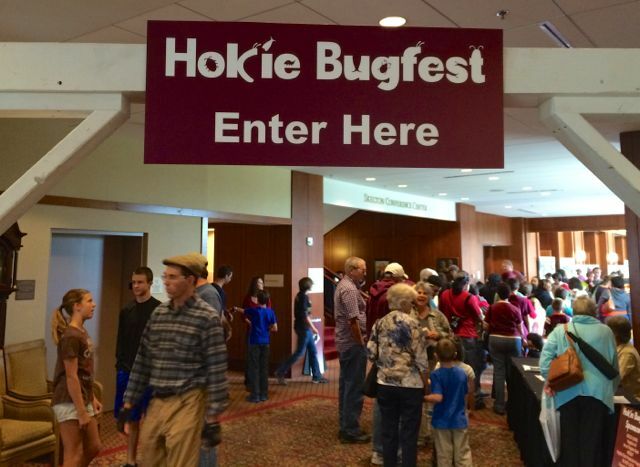 A huge Hokie Bugfest was underway, and the building was swarming with children and their parents. Eventually, we made our way to packet pick-up, and quickly grabbed our bibs and backpacks, and were directed onward for the rest of the expo. 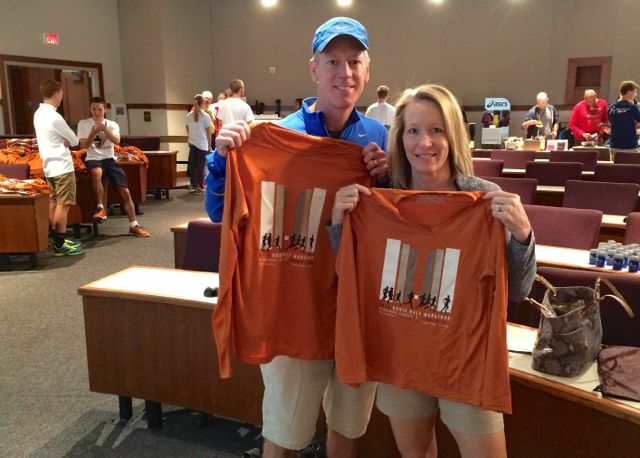 Once in the the lecture hall, we picked up our shirts and had our bibs scanned to confirm that they were correct. Bill and I both love our technical shirts, and I especially love that they had ladies cut v-necks available. 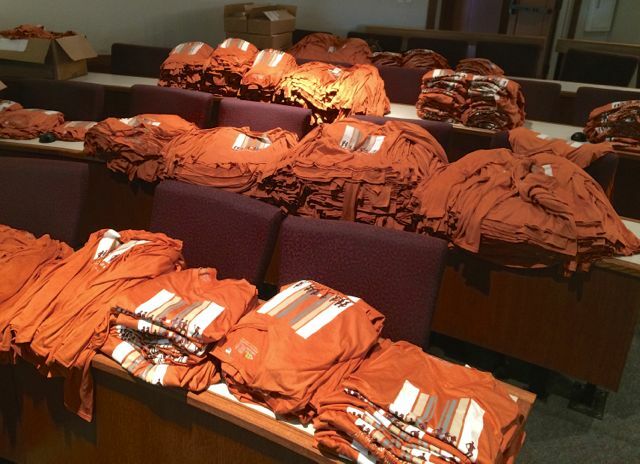 The shirts are burnt orange, and gives us another orange shirt to wear to Orange Effect football games! 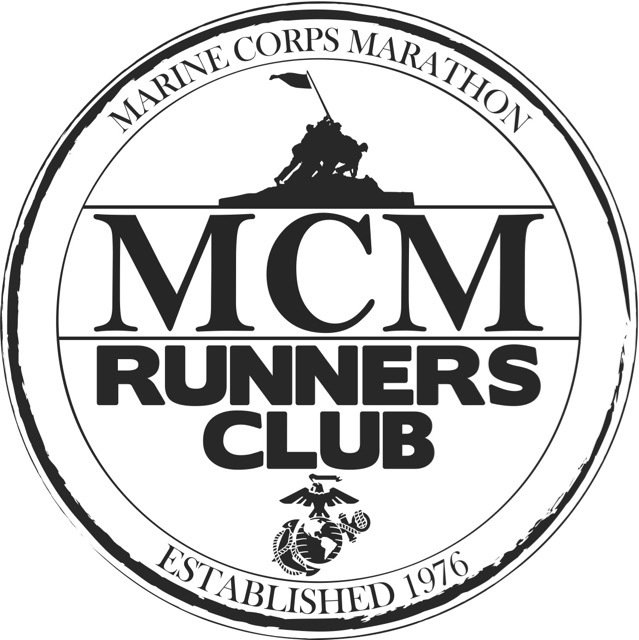 The race shirt has an image of runners running in front of the War Memorial Pylons, and the bib has the same image with little turkey tracks all across it. 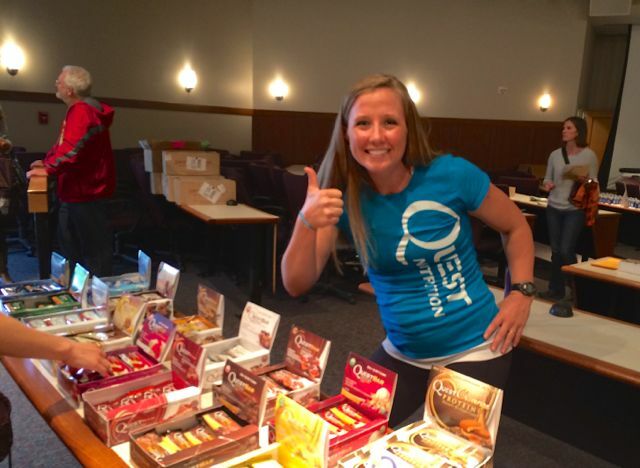 We stopped at the Quest Nutrition Bar booth and talked to their sales rep for quite a while – anyone offering free nutrition bars will get my attention! During the conversation, I learned just enough from this delightful young lady to ask her if she might just happen to be Caitlin’s sister, a fellow Hokie runner/blogger over at Tuff Mother. Indeed, Erin is Caitlin’s sister, and we got a good laugh over what a small world it is! 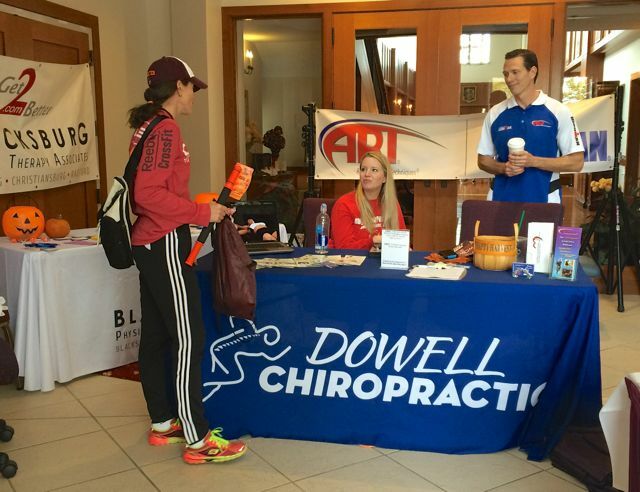 Both Blacksburg Physical Therapy Associates and Dowell Chiropractic had booths set up offering information to runners. 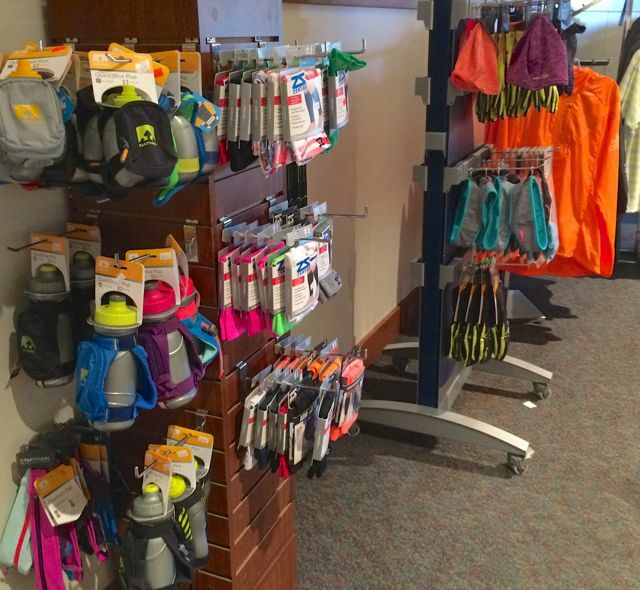 We also looked through the merchandise that RunAbout Sports, one for the sponsors of the race, had for sale. We had just stopped by their store two weeks ago when we were in town for a game, and didn’t see anything new that we needed, so we made our way out of the expo. Upon leaving the expo, we realized that if we had just walked around the outside of the building, and gone in the back doors, we could have found our way to expo without having to fight all of the little bugs flitting around! 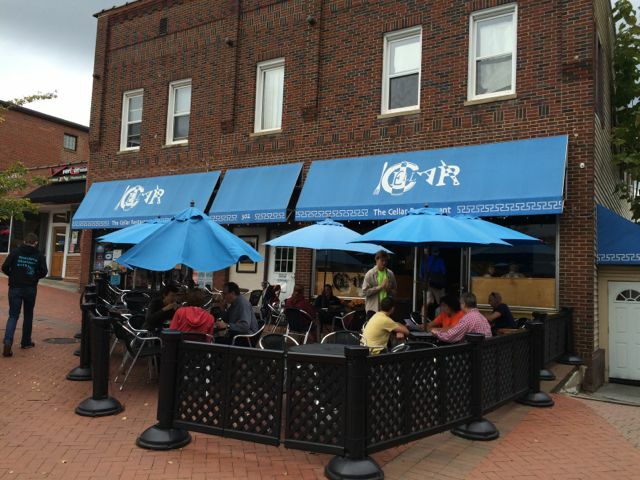 We left the expo to walk downtown for lunch at Greek’s Cellar, one of our favorite pizza places when were at Tech. 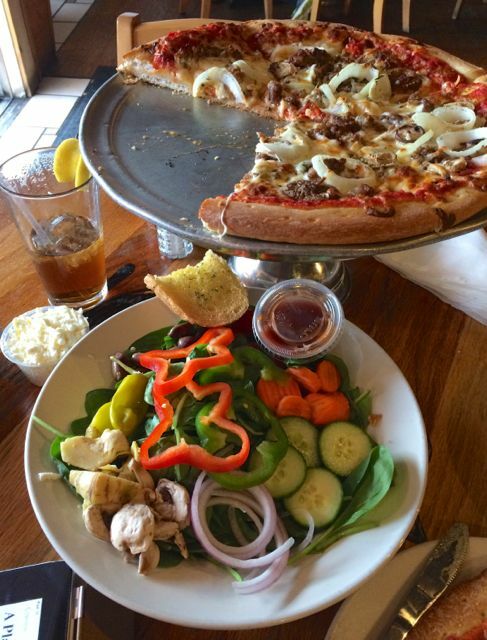 Two slices of pizza and half of the spinach salad was a perfect pre-race lunch! After walking around campus a bit we headed back to our hotel just in time to see Meagan and Barry as they arrived at the expo. 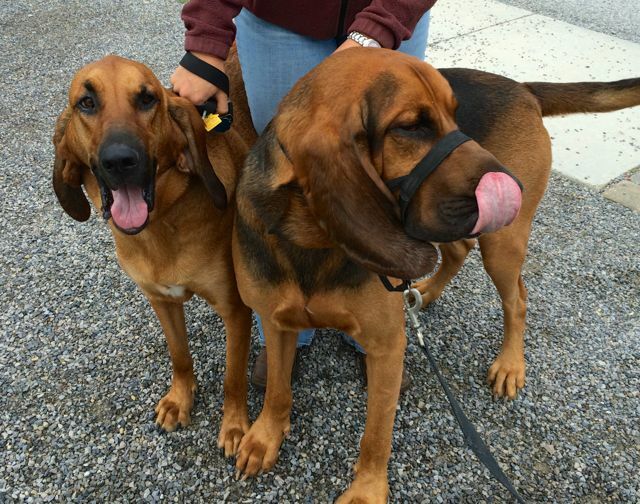 They had Scout (left) and Hank with them, and I had the pleasure of meeting these two sweeties. After relaxing for a while in our hotel room, we ordered carryout at Zeppoli’s Italian Restaurant. While out picking up dinner, we stopped by Kroger’s for bananas for breakfast, and chocolate milk for after the race. 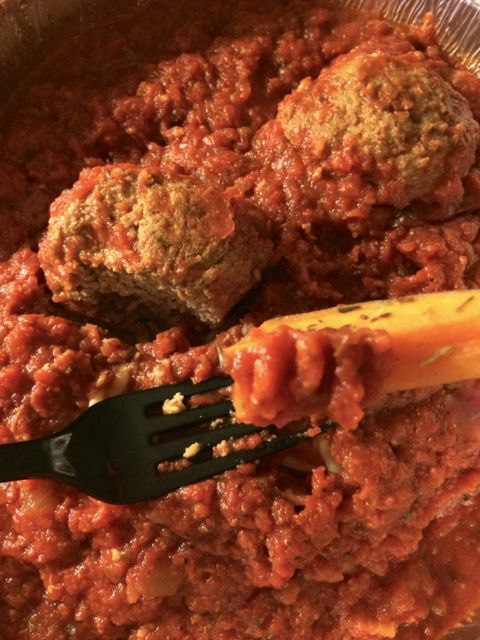 I gobbled up my Caesar salad before I thought to take a picture, but did manage to remember to get a picture of my spaghetti and meatballs. After eating just a little bit of pasta, I started dipping my homemade sweet potato fries in the marinara sauce. Not bad! After dinner, we watched a little college football on TV, and got to bed early in hopes of a good night’s sleep before our 4:45 alarm. Our race was only hours away! 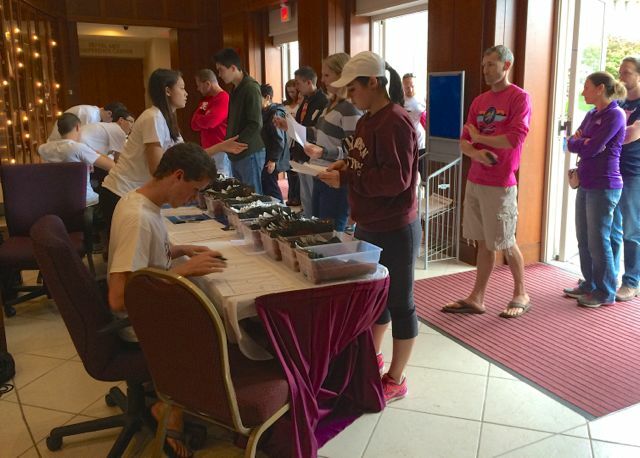 Do you usually attend race expos or cut through them quickly to get your bib and shirt? If you eat them, what’s your favorite nutrition bar? I was so shocked at how hilly the end of the course was! I had no idea they had changed it from last year due to construction (this was my first year running it). Loved the shirts! The muted orange color is just perfect. 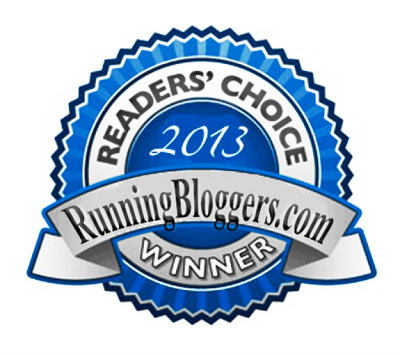 Can’t wait to read your race recap! Tracy recently posted…Can I Be Honest? I had hoped the course change would eliminate that last hill. I was so bummed when I saw the little cones on the Huckleberry Trail, and realized that we would be heading back and doing that part of the course again this year. I guess I didn’t look at the course map well enough (or just couldn’t remember it by the time I got there), but I was really surprised to see that they had us going both ways on that part of the Huckleberry. It got pretty congested. We ran both ways on the trail last year, and I thought that changing the course had done away with that part. I couldn’t tell on the course map that we would be doing that again, so I was surprised when I saw the lead guys coming toward me. It was pretty cool being able to cheer for them, though! I love expos and always buy tons of stuff I don’t need! How many jackets can I have? I didn’t buy anything at this expo (it was really small), but I did buy a Ragnar jacket in the merchandise tent after that race! Lately I’ve been cutting through the expos quickly to get my bib/shirt (crowds get to me… and esp the DC ones tend to be the same). I think for NY I may spend a little more time wondering around. 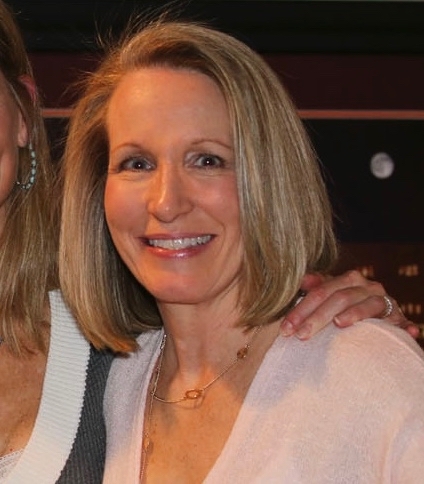 Jennifer recently posted…Living the Sweaty Life: ClassPassDC Launch! I definitely spent more time at the “special” expos like my first Marine Corps Marathon, Big Sur, and Boston. Can’t wait to read your New York City Marathon recap! Good luck! Honestly, I kind of feel like if you’ve been to one expo you’ve been to them all, and they are usually just a scam to pray on people’s excitement which makes them spend money 🙂 I have recently tried to avoid them….now…with that said, I can’t wait for the MCM expo 🙂 And I LOVE my quest bars! !